When one thinks of solitude, the sensation of sadness and isolation come to mind. Yet in this piece, Michael Carson adds a factor of admirability to the experience of solitude. Completely alone, the woman in this piece conveys strength and confidence. The plainness in the background and in the woman’s attire speaks to the idea of how solitude can lead to contentment. While the usage of red accents in the woman’s hair, skin, and clothing adds a flare to the subdued nature of the piece. 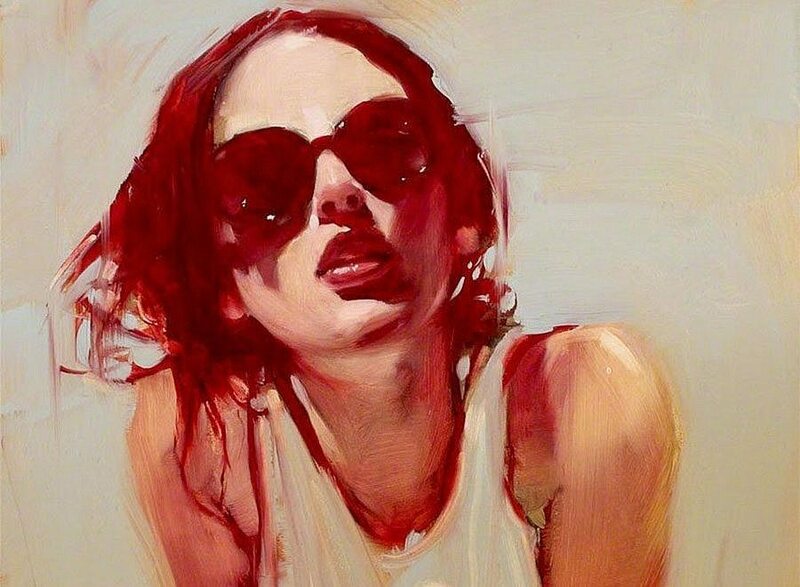 Red, a color often attributed to passion, anger, and intensity gives the woman an air of toughness; her wide-rimmed sunglasses also adds to the mystery she carries. One is faced with numerous questions about the woman: What is she thinking about? Is there a figurative person in front of her that exists in the world of the painting? The viewer can only imagine the woman’s whereabouts. Thus, the intrigue Carson creates in this painting beckons viewers to construct a narrative for themselves. The woman in this painting embodies the attitude of coolness. While the hues of red and white create an overall warm atmosphere, the woman’s body language and facial expression communicates a level of detachedness. The sunglasses cause her to appear uninviting. At the same time, her raised shoulders and tilted upper body gives the impression that she is explaining something or anticipating a response. By leaning forward, the curves in her body are accentuated, adding a soft contrast to her tough exterior. With her red-stained parted lips, she could be whispering a coy remark or leaning in for a kiss. While she is comfortable enough to expose her shoulders and arms, she keeps her eyes hidden with a pair of dark red sunglasses. Melding into her wispy dark red hair, these sunglasses are integral in shaping this woman’s face; they conceal her identity, yet enhance her personality. With the sunglasses, the woman is both cold and cool; she embodies an otherworldly sense of hipster-tude. Without the sunglasses, she bares all aspects of herself to the outside world as one’s eyes often reveal qualities of an individual’s essence. Thus, Carson frames this woman around concepts of coolness and distance to preserve her inner worth. This woman communicates not by “telling” but rather by showing. In maintaining a distance between the woman and the viewer, Carson stresses the importance of shielding one’s true self from the exterior world. To the viewer, she may perpetuate a stereotype of distant hipness, yet for herself, she maintains her own truth. What do you think is this woman’s story? Carson frames this woman around concepts of coolness and distance to preserve her inner truth.